Come here to introduce yourself, meet the Christmas Crew and get help using our forums. We also share news and information from our sister sites in this area as well as coordinate details of our year events, chats and contests. Our sponsors occasionally post special offers for our users in this area, too. . The latest Christmas features exclusively produced by the sites of the Merry Network are featured here. This area is devoted to anticipating Christmas! This home to the world famous Christmas Countdown where thousands of posts are made as the daily watch for the coming season is marked. It is a grand and festive Internet tradition carried on here after years of celebration. This merry area of the forums is where we gather to say hello and to share Christmas year round through a large variety of topics. All are welcome! We're here year round and even though we are scattered all over the world and most of us have never met face-to-face we find ways to celebrate the season together. From our annual Christmas exchanges to scheduled chats our Christmasing together is discussed here. This forum area discusses all the time honored traditions of Christmas. From Christmas trees to mistletoe to great fun with Santa these topics bring us together and inspire great celebration year round. We relish learning of Christmas from all parts of the world and sharing unique cultural traditions from all over. Share your ideas and fond memories here! These Merry Forums now support members from all over the world. We have many active members from the UK, Australia, South America, Canada and all over Europe. Since most of our areas tend to concentrate on the American traditions of Christmas we dedicate this area for discussion of Christmas around the world. Trying to find something long lost from Christmas past? Who knows who has what available! Search and post here. Sell your Christmas stuff here! Discounts, freebies, coupons and specials from Sponsors. Website announcements and links from MMC Sponsors. Looking for a Christmas job? Have a Christmas job to offer? Place your ad here. Have an event to announce? Want to show off pictures and directions to your Christmas display? Announce anything Christmasy here! From eggnog to candy canes to ginger bread and beyond the flavors and treats of Christmas are a delight. Here we engage in all things connected to Christmas foods -- from recipes to how-to's. 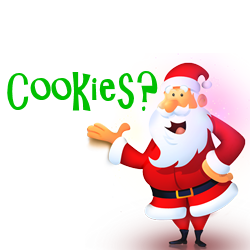 This section of the Merry Forums is presented by Merry Christmas Recipes, our own database of Christmas recipes, many of which get submitted by our users from around the world. Whether you're living healthy already or just want to watch the waistline during the holidays this is the place to talk holiday health, fitness & nutrition. Christmas is a hands-on art. From the lights we put on the house to the decorations we put on the tree to the great foods we eat in the process, Christmas is a time of doing -- and this is the place we gather to talk, plan and share. From Black Friday to Cyber Monday, shopping for Christmas is as fun and challenging as ever. This forum discusses the art of Christmas Shopping. Please note our Forum Rules in regards to links posted in this forum. From 100+ year old silent films to new releases here we discussed the good, the bad and the ugly of Christmas at the movies. Scripture doesn't say it be we know those angels were singing at the manger. And music has been the heart of Christmas ever since. Christmas on the Internet -- it's what we do! For any child of the 1960s (and later) Christmas just wouldn't be the same without television. Talk Christmas on the tube here. New releases, old and hard to find titles -- anything and everything of Christmas that can be played in a machine is discussed here. Recent Christmas themed videos added to My Merry Christmas. Discussions of Christmas on tape or disc, playing on the radio or uploaded here at MMC. Discussion of books, short stories and other bits of Christmas in print. Over the years we have had many memorable discussions and events. Archived here are closed discussions we like to look back on from Christmas past. Spooks hover here! This merry section of the forum is dedicated to talking about our ideas, plans, thoughts and observations of a great day of Fall that just happens to lead right into the Christmas season. Thanksgiving is where Christmas really begins. This topic explores the activities, the foods, the entertainment and the family time of this classic American holiday. Love! Is it anything to talk about? We think it should be! Come discuss your plans for your sweetheart or solicit ideas from others in this forum. It lands on February 24th this year -- what are your plans? Celebrate with us! Donations support all efforts of Santa's Sleigh by My Merry Christmas. Rhyme it or Associate it..